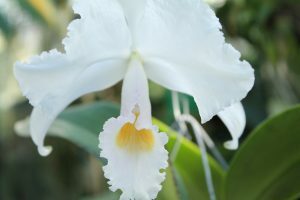 Cattleya trianae is the national flower of Colombia and is endemic to that country. 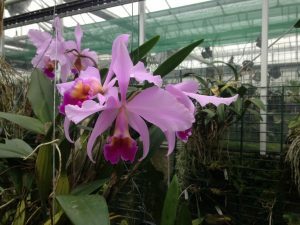 In our greenhouses it always flowers in February where its very large flowers always create a stir. The plant shown is our largest specimen and is the typical form with light pink petals and sepals with a darker lip. The lip colour changes to yellow up inside the lip presumably to help the pollinating bee locate its reward. The natural habitat for this species is in open forests in the Colombian mountains at around 1000m altitude so a minimum of 15C as it gets in Warm Americas is about right. 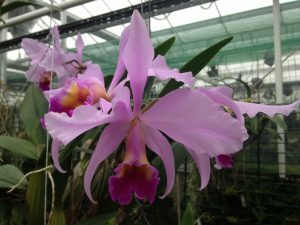 Don’t forget, you can see this plant at the West Of England Orchid Show (this Saturday West Monkton village hall).